Futureguard Aluminum Door Canopy Custom Canvas Co. Features: Heavy extruded mill finish framework, with reinforced center mullion(s) on all sizes. 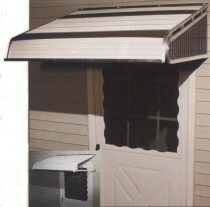 Vented side panels fully enclose canopy while allowing upward winds to escape. Built-in front rain gutter. 2 coat baked on finish for lasting performance. Available in many custom sizes and 13 colors. Shipped partially assembled, with all necessary hardware for quick and easy installation. Insert shown with standard arms, large photo with optional sidewings. Canopies available in solid or striped pattern. (no additional charge) Sides available in solid color only. Undersides of all canopies will be white. Step 1: Select the projection that best fits your needs available in 24" to 60" in 6" increments. If mounting over a door that opens out use at least a 42" projection. Step 2: Measure outside width of door casting. Add at least 3" - 5" on each side for proper appearance, be sure that you don not have a light fixture or other obstructions in the way. Step 3: Canopy Supports: All canopies will be shipped with support arms unless optional sidewings are ordered. Support arms require 3" of mounting space above the door, standard sides require 13" and low mounts require 6". Step 4: Select the color(s) and pattern choice that best compliments your home. The canopy top may be ordered in a solid color or striped pattern. See color selection. Standard Sides require 13" mounting space above the door. The low mount sides require 6" mounting space. All orders Shipped Partially Assembled. *Dickson Fabrics and Sunbrells Glen Raven Mills, Inc. are registered trade marks of there respective companies. Custom Canvas Company is an independent reseller and in no other way affiliated.